This challenge has been moved so you can sign up here. 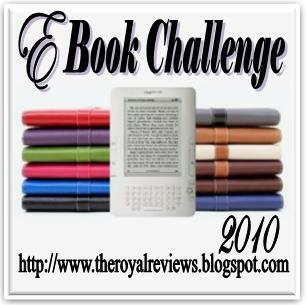 I was just wishing for an e-book challenge and I got my wish. I'm getting a nook shortly or so they say, so will be signing up. Just have to go add you to my long list of challenges. Great Challenge here I read a lot of e-books!! Awesome challenge ladies! I'm looking forward to it. My post is here. Mash 1195, all challenges on Royals can cross over for other challenges. Thank you..going to visit Mr. Linky and enter. Please ignore or fix #9. My computer got away from me and started doing its own thing. Sorry about that. I love reading ebooks on Kindle and my iPhone. I look forward to the challenge. I never thought of Kindle as being an ebook. I use Guttenbery for mine. I am so glad that I found this challenge! :-) As I have bought an Ereader, but I have not really used it yet, so this challenge is just what I need to 'bond' with my Ereader! So glad you're taking over this one too! I'll be signing up for this one too. I am looking forward to completing this challenge on my new kindle. I plan to meet the "obsessed" goal. Alaine, I am joining this one too! Kindle love! Count me in!!! I love my Kindle! I am up for the challenge and I will pick 20 (since I am signed up for the 100 book challenge I have to hit that along the way)! I'm soooo in! I'll try to make my reviews in both english and spanish. I signed up for Addicted. Thanks for hosting!! Hi Larissa, of course that counts! I am excited to have found your blog and this challenge. And 77 is my favourite # lol, how cool. Hi, I am number 79 and 80 - 79 was an accident. is there anyway of deleting it? Hi Becky, no worries I'll fix it! Thanks for joining the challenge! I am signing up for the Addicted level. I have some e-books that I haven't read yet and this will make me read them. Can the books be cross listed with other challenges? Can we retrograde our books if we join now or do we start from the day we sign up? Do we need to write reviews for all the books we read or do we just list them?? Ebook Addict - You can include books from whenever you like. No reviews aren't necessary, just leave a comment for the books you've read if you are not reviewing them. Count me in at the obsessed level. My blog post has been added. porcelaine, thanks for joining us! Hi Alaine! You won't believe.. I completed this challenge. I signed up for 3 e-Books and I am done. I am happy! Congratulations Veens, that's fantastic. Well done! What a perfect challenge for me -- I pretty much read nothing BUT ebooks! Thanks for hosting this great challenge! welcome to the challenge stealingdreams. Can't wait to get started on this one! Thanks for all the great challenges. I finished the challenge a while ago but just now wrote my wrap-up post. I loved this challenge. I recieved a Kindle for Christmas and went ebook crazy! i am a late started, but i am starting!